On Friday, March 13, 2015, Army Ranger Lead The Way Fund, in collaboration with Jared Allen’s Homes for Wounded Warriors (JAH4WW), will host a private Home Key Ceremony for Army Sergeant First Class Cory Remsburg. Since sustaining his life-altering injuries on October 1, 2009 when SFC Remsburg’s platoon hit a roadside bomb in Kandahar, Afghanistan, Army Ranger Lead The Way Fund has played an integral role in supporting Cory and the Remsburg family through his long and arduous rehabilitation and recovery process. Like the Ranger Creed he vowed to uphold, Remsburg has ‘displayed the intestinal fortitude required to fight on to the Ranger objective and complete the mission,’ his new mission – his fight to regain his speech, use of his extremities and the independence he has longed for. In February 2014, Army Ranger Lead The Way Fund proudly helped make that dream of independence a reality for SFC Remsburg when they purchased a home for Cory in Gilbert, Arizona. The home purchase is a first for the organization, who has several other severely wounded Rangers in line for this new initiative. Remsburg’s home will be 100% free and clear of any mortgages. Over the past year, Jared Allen’s Homes for Wounded Warriors took on the extensive remodel of the home to make it completely ADA accessible for Remsburg. The remodel has included the widening of all doors and hallways, smooth tile throughout, custom bathrooms and kitchen, wheel in sinks, new windows and doors, a wheel in pool for rehab, therapeutic spa, a guest home for his caregiver, a home gym, new appliances, outdoor patio and BBQ, a new roof, concrete paths for wheelchair, all controlled by a home automation system. The March 13 ceremony will include Keynote Speakers Jim Regan, Chairman and CEO of Army Ranger Lead The Way Fund, Mike Christensen from Peak One Builders, the Remsburg family, and all-pro defensive end Jared Allen. The ceremony will also include on open house tour – marking the completion of the home remodel, as the keys are proudly handed over to Army Sgt. 1st Class Cory Remsburg. Arizona contractor, Peak One Builders and Kilbane Architecture designed the home. The project was also made possible because of large donations and grants from organizations such as RIDE 430, The Joshua Chamberlain Society, Wells Fargo, Home Depot, Boeing, and the Department of Veterans Affairs. For more information on Army Ranger Lead The Way Fund, please visit www.leadthewayfund.org. 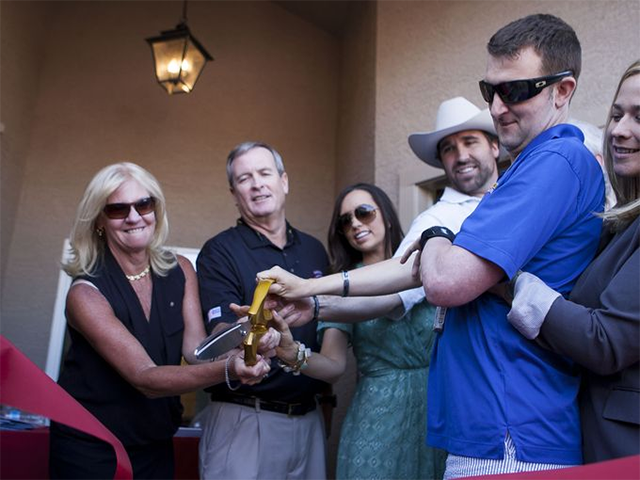 For more information on Jared Allen’s Homes for Wounded Warriors, please visit www.homesforwoundedwarriors.com.